Anne Hathaway and Rebel Wilson are nasty women in the big screen update of "Dirty Rotten Scoundrels." They’ll play variations on the roles originally played by Michael Caine and Steve Martin in the 1988 original. The new version will update the story by putting the focus on two lady cons attempting to get money from a rich tech prodigy. The original "Scoundrels," released in 1988 and directed by Frank Oz, was itself a remake of the 1964 film "Bedtime Story," which starred Marlon Brando and David Niven. "Scoundrels" starred Steve Martin in the Brando role and Michael Caine in the Niven role as mirror-opposite conmen competing to scam money from a seemingly guileless American woman and banish each other from their South of France hunting ground, Beaumont-sur-Mer. The comedy also was spun into a Broadway musical in 2005 that starred Tony-winning actor John Lithgow. 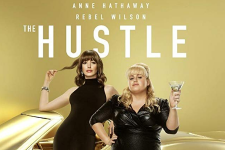 The Hustle hits theaters May 10!